FDS Eggerland (JPN) in 36:58.98 by adelikat. Eggerland is a predecessor of the NES Adventures of Lolo games, and in certain ways, it has much more features than Adventures of Lolo 1. This movie abuses a couple of the game bugs in a surprising way. 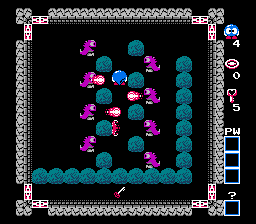 Note that this is a Famicom Disk System game. Read What is FDS for more information. Also note that this movie is about 42 seconds longer than the previous movie. This is due to the inaccurate (shorter) FDS load times emulated by famtasia.